So I'm currently sat preparing for tomorrow's Sociology seminar which is on Thatcherism, a topic that I'm growing particularly fond of. I have 10 newspaper articles that I have to go through to prepare for a discussion on her legacy. As you may know from my pervious blogpost on Margaret Thatcher and her most rememberable outfits I admire her for her power dressing and the influence she had on the fashion industry, along with various other achievements. 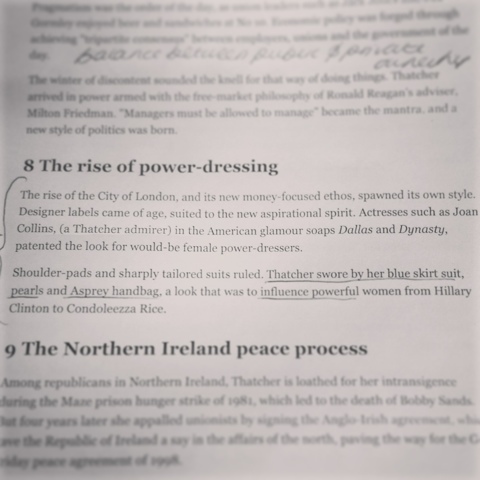 As I was reading an article from The Guardian discussing '20 ways that she changed Britain' I was attracted to reason number 8, entitled, 'the rise of power dressing'. I was incredibly impressed this was included within the article commenting on aspects such as her trademark blue skirt, pearls and handbag and the influence she had on other powerful women. It's nice to know that her influence in the fashion industry, by people other than her outfit admirers, is recognised.